A fifth-generation farm family and the great great granddaughter of the fifer portrayed in Archibald Willard’s famous “Spirit of ’76” painting have helped the Land Conservancy permanently protect about 384 acres in southern Lorain County. The Cowie and Browand families have recorded conservation easements protecting property in Rochester and Brighton Township, according to Andy McDowell, director of the Land Conservancy’s Firelands Field Office. A conservation easement permanently protects the natural, agricultural and scenic resources of the land while allowing the property to remain in private ownership. 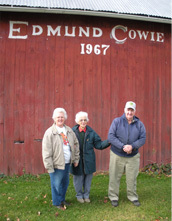 The Cowie farm has been in the family for four generations. The current owner, Rhea Cowie, 91, and her family permanently preserved 208 acres of the 220-acre farm. 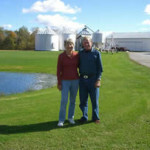 Her son, Gerald Cowie, is a Rochester Township trustee and has served for over 20 years with former trustee Jarvis Babcock, whose family permanently preserved more than 1,000 acres in 2007. 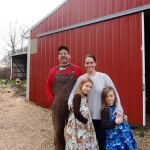 The Cowie farm has transitioned over the years from dairy to beef to hogs and currently to grain. The farm also contains three tributaries to the West Branch of the Black River. 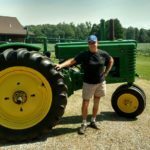 The Browand property, which is located in Brighton Township, has been in the family for five generations and is a designated a Century Farm by the Ohio Department of Agriculture. The conservation easement will preserve 176 acres of the 182-acre farm. Current owner Joyce Browand’s great great grandfather, Hugh Mosher, who served as the model for the fife player in Willard’s patriotic “Spirit of ’76” painting, was born and raised on the farm. Mosher served in the Civil War and was considered the finest fifer in Ohio. “Our thanks go out to these wonderful people who are not only preserving this beautiful property for future generations but are also preserving the rich history of Lorain County. It is truly an honor to help protect these farms,” said Andy McDowell, director of the Land Conservancy’s Firelands Field Office. 2009 was a good year for land preservation out of the Land Conservancy’s Firelands field office. In addition to the 384 acres in Lorain County, the Land Conservancy preserved 665 acres in Huron County, 148 acres in Ashland County, 61 acres in Erie County and 44 acres on Johnson Island in Ottawa County for a total of 1302 acres permanently protected.